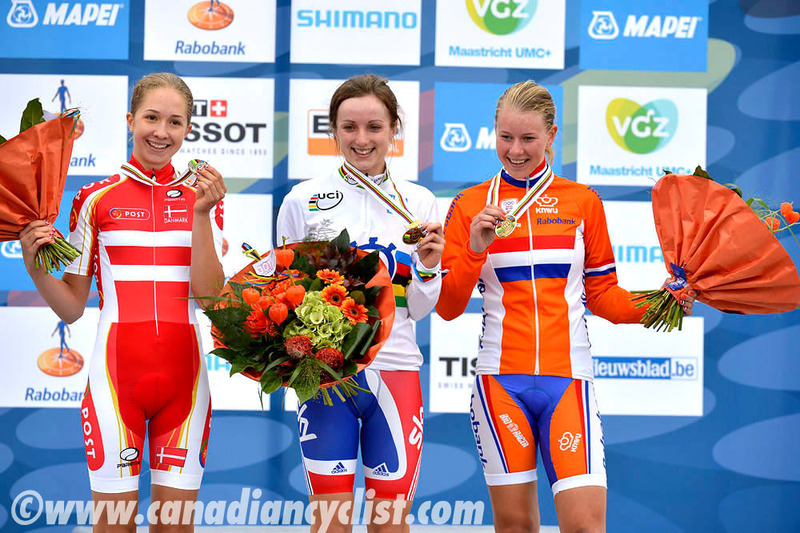 Day 3 of the Road Worlds in Valkenburg, Netherlands, saw the Junior and elite women time trial championship titles awarded. Judith Arndt (Germany) took her second consecutive elite title, while Elinor Barker (Great Britan) won the Junior title. Canada's top finisher was Joelle Numainville, with 21st place in the Elite race. The Junior women faced the worst condition so far in the championships, with rain sweeping in part way through their 15.6 kilometre race. One of the riders impacted by the conditions was Canadian Junior champion Saskia Kowalchuk, who crashed early in her ride on a wet road marking, requiring a bike change. The weather and roads had dried up for the 24.1 kilometre elite women's race, but the wind had also picked up. Ina-Yoko Teutenberg (Germany) was the first to reach the 34 minute mark, with 15 riders to go, and her time held up until Ellen van Dijk bettered it by nearly 40 seconds with seven riders remaining to finish. van Dijk had no time to enjoy the lead, however, because Evelyn Stevens (USA) was the next finisher, nearly 20 seconds ahead. Stevens gradually ramped up her effort, to pull ahead convincingly on the final clib up the Cauberg. However, Arndt went out hard from the gun, seven seconds up at the first split, ten seconds at the second split and then flying up the Cauberg to win by 33 seconds. Arndt has announced that she will retire at the end of this season.